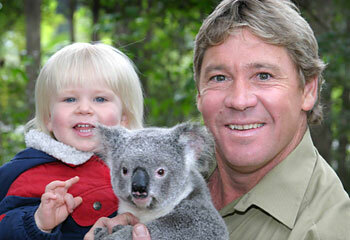 Steve Irwin and his son Bob. Little Blondie. u are my hero Steve. Q. What do you get when you cross a Crocodile with a Koala Bear? Grow up strong like your father youngman and you can't go wrong. Bob, your dad left you. I know it hurt but you have your mom,Bindi and your dad's best mate, Wes. Look and this picture and know how much your father loved the animals, your mom, your sister Bindi, Wes and you as well as many of his co-workers. He loved you a lot and I'm sorry for your loss. Your dad was a great man. We'll miss him. Bob, I wish this hadn't happened to one so young, but I know you will do so well in life. You've got the best of two wonderful people in you, and a special strength of your own. . . keep your chin up little mate, and keep marching forward! Bob will you marry me? 2 the next Crocodile Hunter! !LOVE U BUNCHES!!!!!! Steve: What Jesus was to humanity you are to animal conservation. Long live your love and passion and may your legacy never be forgotten. God bless the Irwins! It is so sad that Steve Irwin died.He died at what he liked doing best.His wife and children will always have great memories of him.We thank him for sharing those great memories with us too. Will be missed by so many people!!!! YOU LOOK JUST LIKE UR DADDY BOB!! LOVE U!!!! omg that is the best hoo bob is sooo adorable!! and steve looks so imocent~ y did u hav 2 go steve! dang. bob has steve's eyes. Oh my god .. They are so cute. And they look like they are happy.. Here in Denmark is the most people all so sad..